A new extremely fast lens system combined with a high resolution Gen 1+ light intensifier tube gives the user an unparalleled bright image in a 1st gen. night vision device by just easy push button controls. Therefore the PKI 5255 is recommended for most comfortable and hand held use at any observation tasks in the dark. It is a must to use this unit by police forces, secret services and other government departments where such investigations have to be effected under lowlight conditions or even in total darkness. With its effective range of approx. 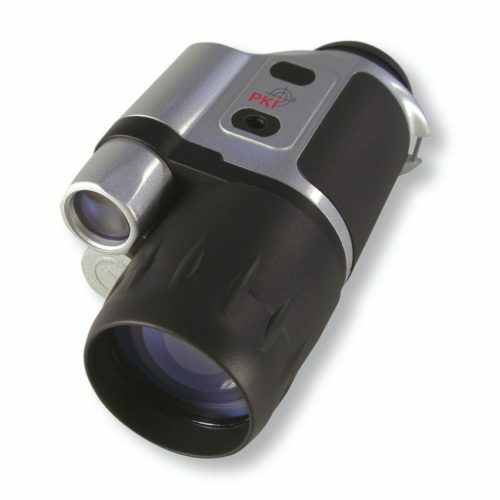 150 to 200 m the PKI 5255 provides perfectly illuminated pictures, which allows excellent observation results. The built-in IR-Illuminator provides additional light, being invisible to the human eye, allowing the user to observe his target even if there is no surrounding light. The adjustable hand-buckling belt makes its handling very comfortable.